Ford Analytics Team Democratizes Data-Driven Analysis | Constellation Research Inc. 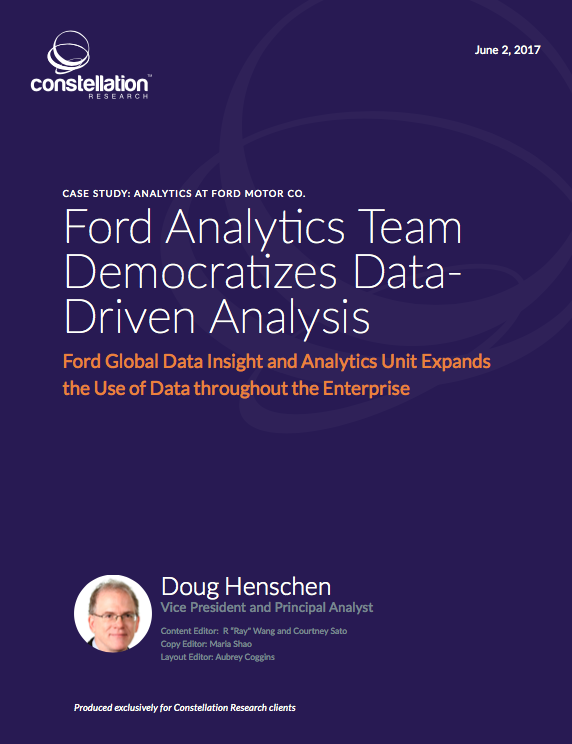 This case study documents establishment and functioning of Ford Motor Company’s Global Data Insights and Analytics (GDIA) unit, a centralized data science team organized to share analytical best practices and spread optimized, data-driven decision-making across the organization. Ford Motor Co. relied on data analysis for decades prior to the establishment of GDIA, but like many companies, it did so in pockets of the business, with little oversight to ensure consistency and coordination across the organization. Growing from a staff of one at launch in January 2015 to more than 600 professionals, GDIA shares its expertise across every aspect of Ford’s business, including human resources, manufacturing, research and development, warranty, supply chain and accounting. GDIA is also applying its expertise in emerging areas as Ford expands to be both an auto and mobility company. Premium content. Log in to your account here. If you do not have a premium membership login, become a member of the Constellation Executive Network or Research Unlimited account. Please contact sales@constellationr.com to ask about your access options or click the price below to purchase this report individually.